For 2014 the new Rally is faster, more maneuverable, and offers better low-end power making it the most efficient and user friendly kite in the world. Find out for yourself why so many riders trust the Rally. 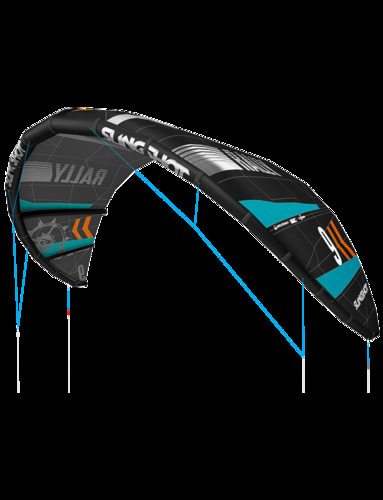 The 2014 Rally boasts an updated airframe featuring our own unique patented Splitstrut construction making it the most stable kite in the industry. Each size is more powerful and efficient than last year with a new aspect ratio. I owned this kite for 2 years now and I cant say Im very satisfied with it. Im a fairly heavy rider (215lbs) and every time the kite goes fully powered the leading edge doesnt handle the pressure and opens at the wingtips. This is very annoying. Another strange behaviour happens when the kite crashes with some slack in your lines. From my personal experience, the kite will flip 50% of times or fly inverted 25%. It only leaves me with a slim chance of getting it to relaunch without a twisted line. Its a nightmare during downwind. Also, I wind the kite very hard to steer when its supposed to drift in waves. But its a good kite for flat water (no downwind) with very good wind range. But I cant figure how its a kite that is easily relaunchable. For me the Slingshot Rally 2014 is a fast, maneuverable kite and having a great low and high-end power what's maligning this kite for me the most efficient and user friendly kite in the until now. It's a really stable and powerful kite. What i really like on the Rally is the big air-time. If you give a nice pop en pull the bar you are flying!! What i also like is the great downwind drift. The kite simply will not fall out of the sky even when carving downwind with a lot of speed. The Slingshot Compstick control bar is an amazing nice one. If you hold it you can only think...this is finished! Well done! The only comment i have to give is de way to depower the kite when it's overpowered. It can be a bit difficult to trim. We've tested the Rally in several conditions, on twin tip, strapless flat water, and strapless wave conditions. Its allround performance on flat water is outstanding. A great kite for big air, but still easy to maneuver with one handed strapless tricks. It has a great dead moment for practicing transition tricks and while I was on the water with a 10m2, my friends were on with 11 till 13. Resume: A great allround kite with a proper feedback. Easy plug and play but not as playful as you may desire in the waves. This kites goes really easy upwind. Its easy to go high and fly long on this kite. Also really stable in the air. Easy to handle but not as quick in its turns as I expected. Tested the Rally on an inland lake with gusts between 14- 22 knots. A had a great session with the Rally. Pump up the leading edge really hard and you got a stable, easy to ride freeride kite. Always control, good low end to ride through the gusts. The Rally isn't the fastest kite around, but I didn't mind because the gust control, easy power building and great float gave me a great session. This is a great first kite or for freeriders who ride in lots of different conditions. Well done Slingshot! Aloha from windy Sri Lanka! In our center we had the pleasure to work and test Rally 2014! It might look that there are not a lot changes from 2013 but for sure you can feel them. Easy to relaunching , absolutely the best bar ever and it's so good to teach with! Upwind and jumping performance are good with medium bar pressure, good hang time also! Basically is all you need! I really like the airtime and the easy riding of it. The heavy bar pressure i like because then i really have the feeling of kite control. It's also an easy kite to relaunch whats makes it a nice kite for the beginner as well. And then...the big airtime! This is absolutely great. Like all the other Rally's its a all-round sheet and go kite. Early power, lots of feedback easy to jump and if you want performance you can find it in its low and high end big air category. Smooth lift and a great float with solid control. In the turns its a little bit slow and backstall a bit when you have to much power on the steering lines. Still the Rally is always one of the great all rounders with a big wind range! The 2014 rally is hands down the smoothest kite we’ve ever flown. We know that "smooth" is a very overused adjective in kiteboarding but as you sheet in on the bar, the power comes in such an even way that it makes the Rally a joy to fly. The best way to describe how it feels is to compare it to the feeling of skateboarding down a bumpy road and turning onto a freshly paved street with an insanely smooth surface! That smooth easy cruising feeling is exactly how the Rally feels in your hands! 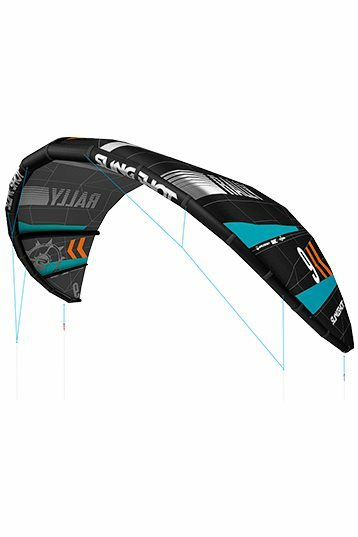 We tested a variety of sizes and you will be pleased to hear that this kite performs consistently through the sizes. One of the major attractions of the new Rally is the wind range. The Rallys have always had excellent wind range but the 2014 version is just ridiculous. During one particular session riding the 10m the wind was a little up and down and the difference in power between full power and full depower is insane. Based off our experiences, the 10m's wind range has got to be almost 15 - 30mph! This version of the Rally felt a little slower than some of the other speedy kites available. It's still far from being a slow kite but the increased stability and smoothness have sacrificed a tiny bit of zoom. The only other thing worth mentioning is the wingtip flare. Over the years, Slingshot have worked to completely get rid of any flare (buckling) of the wingtips while flying the kite and they've done a fantastic job because the 2014 Rally is more solid in the air than ever before. Nevertheless, if you're 200lbs+ and loop the kite hard through the wind window in windy conditions while edging hard against it - the wingtips are going to feel the pressure and bend a little. Because you spend most of your time free-riding and are looking for a kite that excels in wind range, relaunch and stability. The Rally dominates in these characteristics and that makes it an outstanding choice for an all around kite.